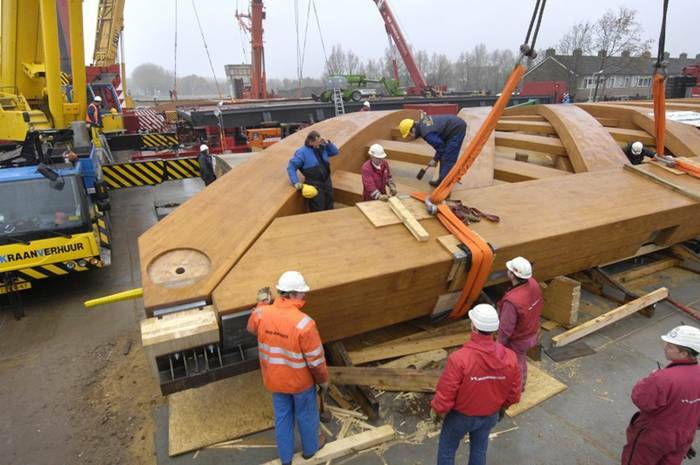 We regarded it as important to elaborate the wooden bridge in such a way that it would be both recognizable and new to Sneek. The contours call to mind the traditional cheese-cover farmhouses of Friesland; the construction evokes reminiscences of the building expertise that it still abundantly present in the old city; the wooden beams reflect the shipbuilding industry, with Sneek as the water recreation city par excellence in the North Netherlands. All these aspects led to the first uncovered wooden bridge in the heaviest load class. 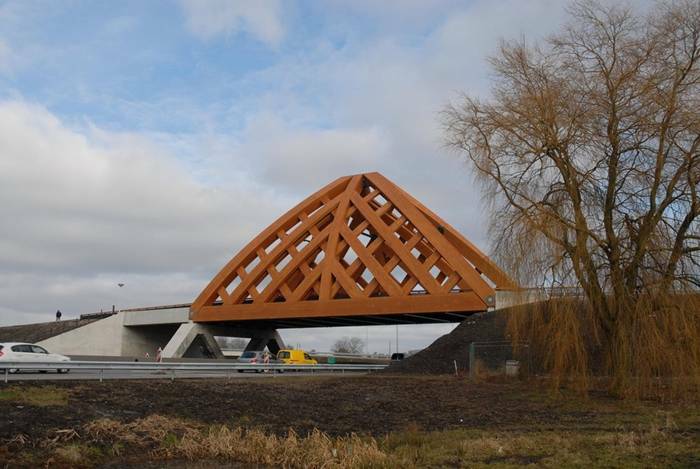 This bridge is not only a novelty for the Netherlands but also for countries such as Canada, Norway and Switzerland where the covered bridge is a well-known feature. 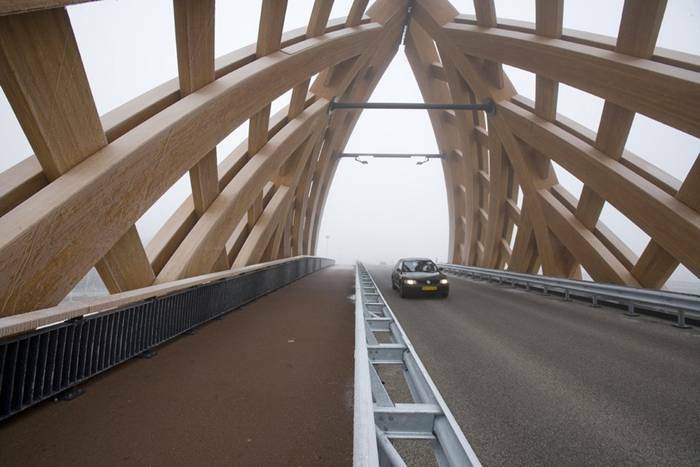 The bridge consists of Accoya wood, an acetylated type of wood that has been produced in a factory in Arnhem for around one year now. 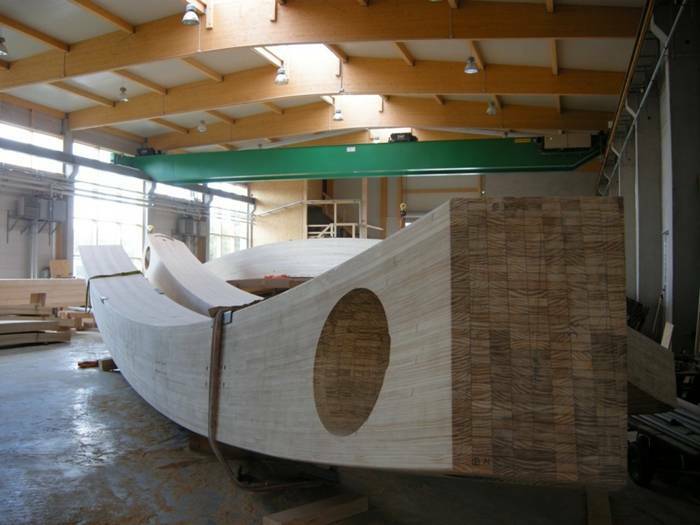 The acetylation of wood is a process that makes wood almost imperishable. 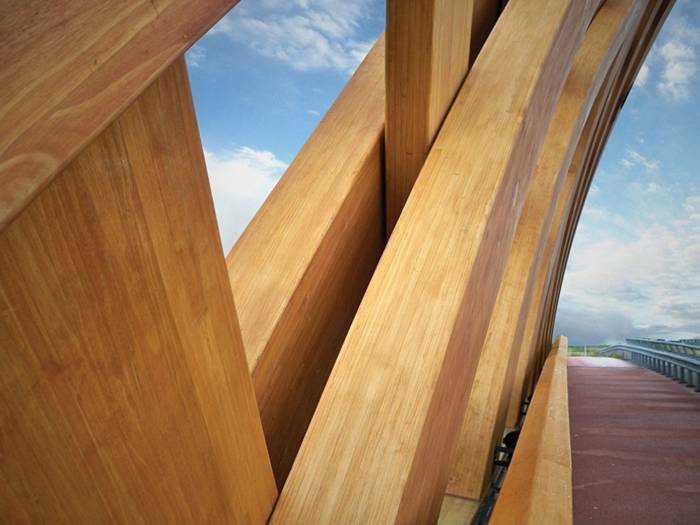 The design of the bridge is a fusion of infrastructure, construction, art and architecture. 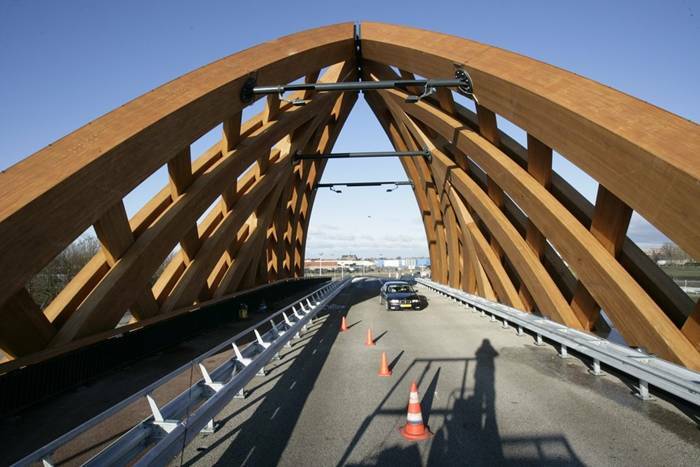 As a component of the renewed A7 motorway, the wooden bridge was envisaged at two positions. 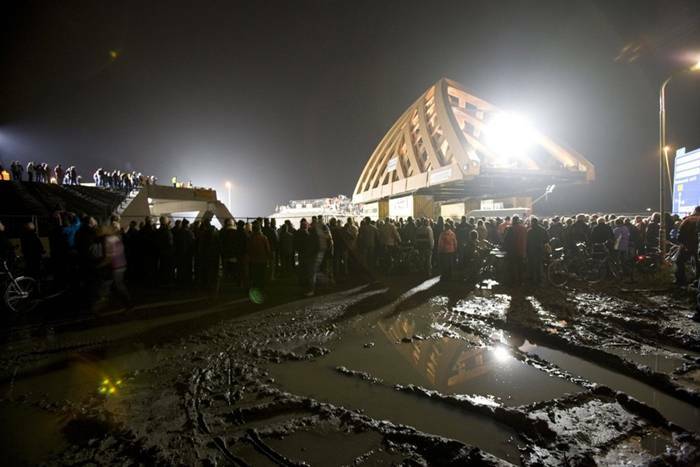 The second wooden bridge will be realized in 2010. The interface of the A7 with the inner city is thus defined for the motorist, for whom, when on the motorway, the bridge is a city marker. For passers-by crossing over the motorway, it is a gateway between the inner city and the suburbs. Besides motorized traffic, pedestrians and cyclists also make use of the bridge. 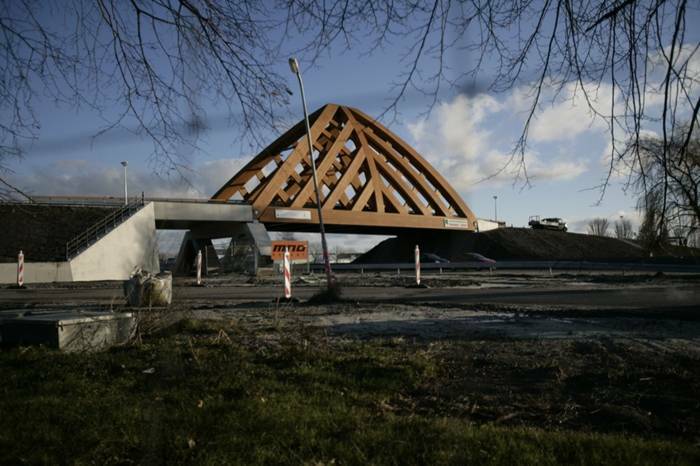 The two wooden trusses have been coupled together at the centre to ensure stability. 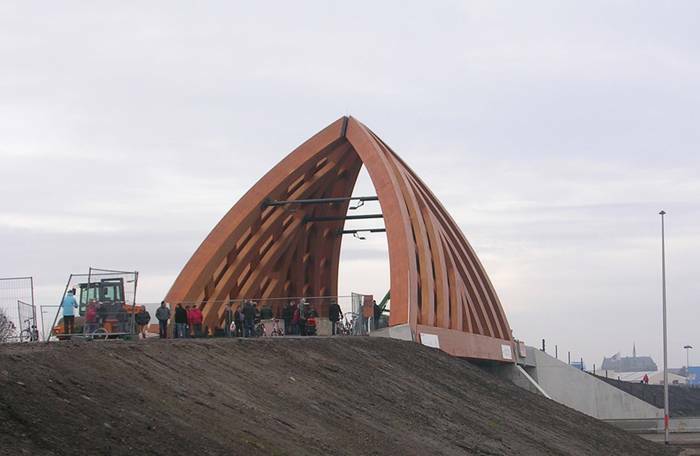 The arched form arose by optimizing the cross-section of the bridge for traffic. In conjunction with the triangular structure of the framework, this offers surprising visual perspectives. The bridgehead on the suburb side is a green dike element, whereas on the inner-city side it is a concrete span that bridges a waterway. 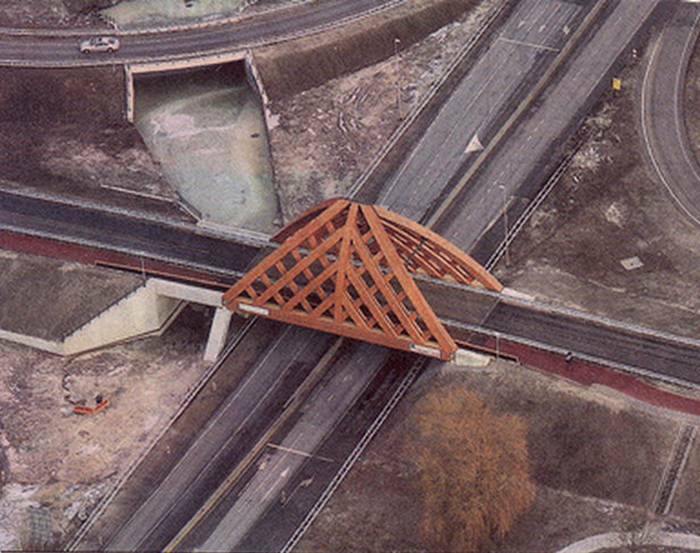 The bridge was created as the result of an intensive and integrated design process. 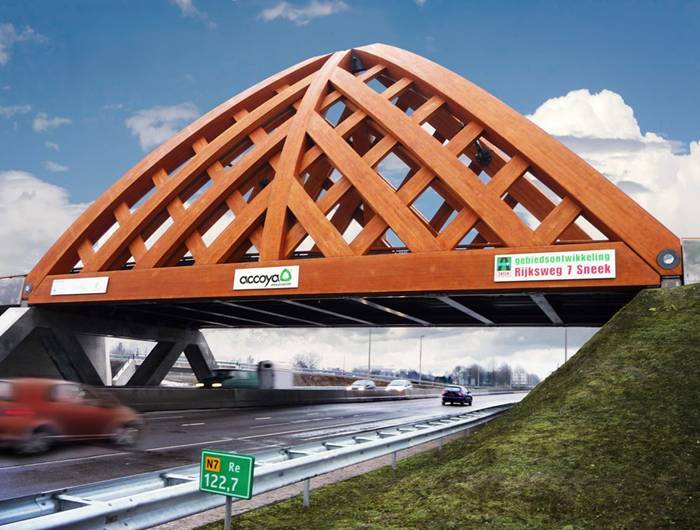 In consultation with the client, we were able to compile a team of professions and critics who made it possible to realize the bridge. 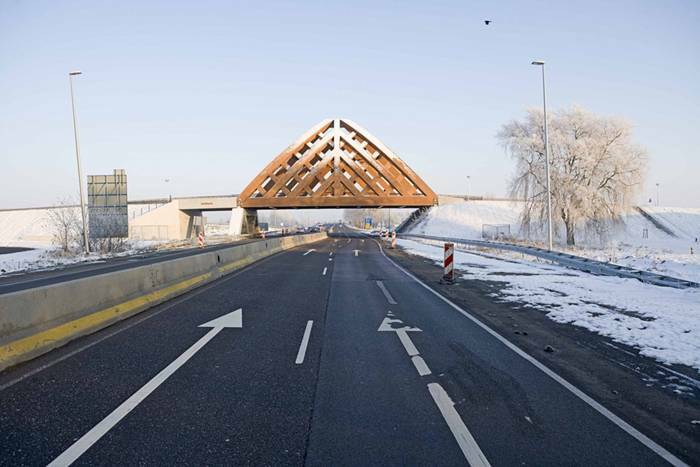 The bridge was built by a contractor from the town of Schwäbisch Hall in southern Germany, where the tradition of producing half-timber houses, and also bridges, is well known. 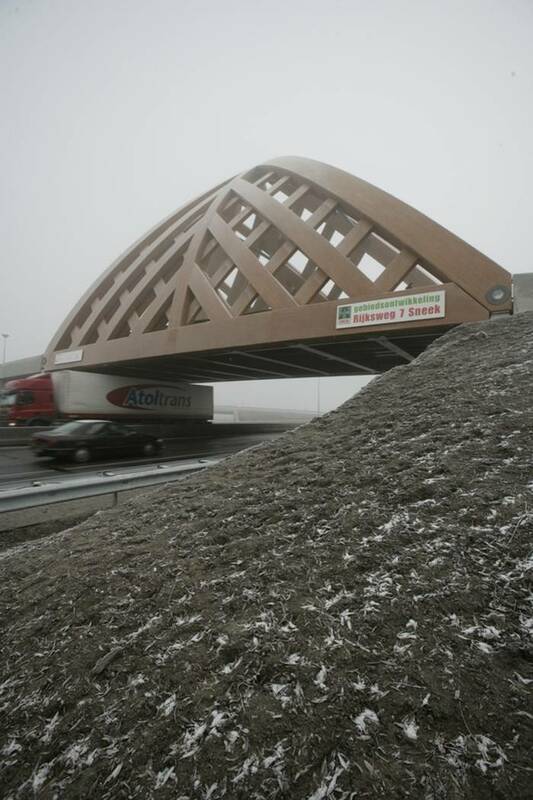 The bridge is the first wooden constructed bridge in a high traffic class. The first of it’s kind in the whole world. 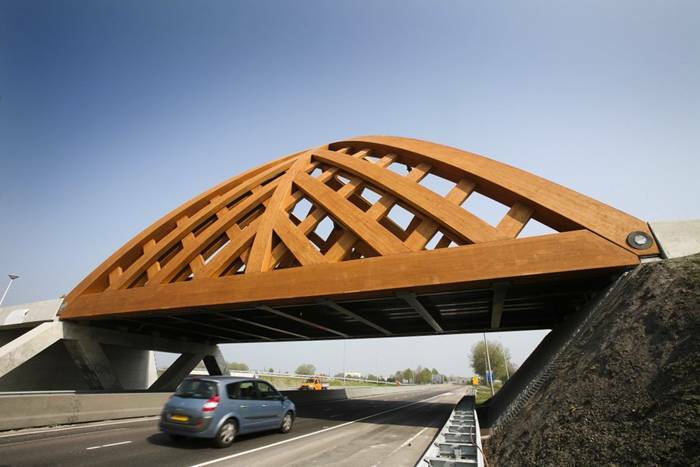 OAK Architects: Haiko Meijer, Alex van de Beld, Hans Achterbosch. More Images.